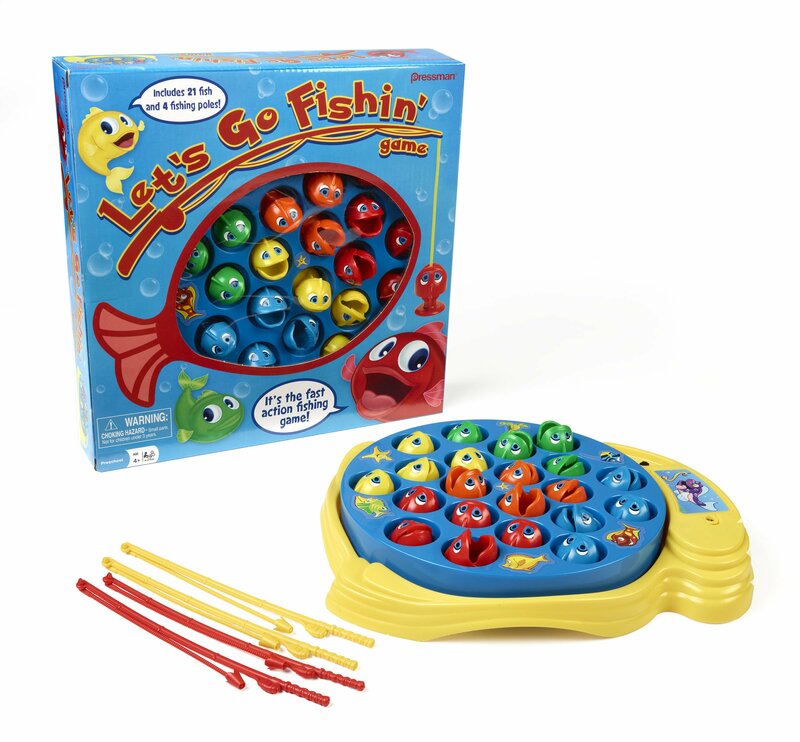 Our Let's Go Fishin' game is the original version of awell-known and well-loved fishing game that parents will remember playing whenthey were kids. This classic kids game teaches hand-eye coordination asplayers use their mini fishing poles to try to catch the most fish. Thechallenge is that the board game spins, and the fish open and close theirmouths. With 21 fish and 4 fishing rods, there's plenty of fishing fun in thisfast-paced competition, and these fish are as hungry as hungry hippos. Let'sGo Fishin' is a fishing toy that's great for playing at home or as a travelgame--it will lure kids into playing over and over again. For 1-4 players ages4 and up. Requires 1C battery (not included). From the Manufacturer Our Let'sGo Fishin' game is the original version of a well-known and well-loved fishinggame that parents will remember playing when they were kids. This classic kidsgame teaches hand-eye coordination as players use their mini fishing poles totry to catch the most fish. The challenge is that the board game spins, andthe fish open and close their mouths. With 21 fish and 4 fishing rods, there'splenty of fishing fun in this fast-paced competition, and these fish are ashungry as hungry hippos. Let's Go Fishin' is a fishing toy that's great forplaying at home or as a travel game--it will lure kids into playing over andover again. For 1-4 players ages 4 and up. Requires 1C battery (not included).